The last official weekend of the summer before the autumn equinox was a beautiful one here … 80 degrees F and sunny. So I took advantage of the weather on Saturday and .. sat in front of my computer almost all freaking day. Yeah. I blame the Dreamweavers or whatever those druids in Val’sharah call themselves, because if they had just given me a unicorn I would not have been so determined to jump through the necessary hoops to obtain a Lucid Nightmare. For those unfamiliar, the best guide is this extremely detailed comment on Wowhead. So I sat down on Saturday morning to get started. The college football game that I wanted to watch started at noon so I figured I was going to be stuck inside watching that anyway, I may as well work on this while I’m at it. I started before the daily reset, which happens at 11am my time, so it was probably around 10:30am. 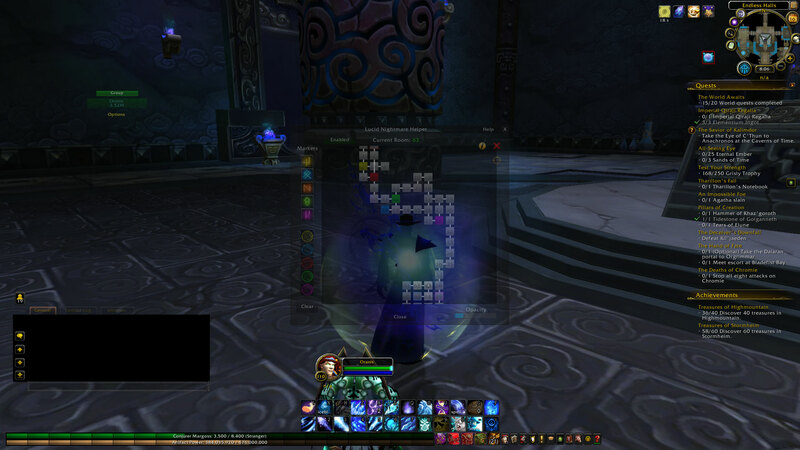 I was in Ulduar somewhere when the reset happened. Now, I did make this take longer because I figured as long as I was there and still need pets, mounts, and transmogs, I was going to run the whole thing. The lights on/lights off pattern was quite easy really, except for the Dark Rune Sentinels that kept spawning every so often and putting me in combat from Razorscale’s area even though I had killed her. And I did complete the 25 man mage set and get two of the pets that I needed, so it was a good run. All the rest of the stuff up to the Endless Halls was easy and painless for the most part. Note that you can skip that annoying slime boss in Ahn’Qiraj. I’m not sure what time it was when I finished up these things and headed to Kun’Lai. I took a couple of breaks to get a couple loads of laundry done and hung on the line since it was nice out, and made some lunch. So it was after lunch but still early afternoon. Let’s say 1:30 eh? O. M. G. It sounds easy enough, but with the different levels and the warp rooms there was NO WAY I was getting anything accomplished by trying to map it out on paper. I spent about 3 hours on it before I’d had enough and just plain went AFK to take the dog for a nice long walk. After we got back and I fed him and made myself a sandwich, I downloaded the Lucid Nightmare Helper addon. Do yourself a favour and just go do this before you even get to the Endless Halls. Even with the helper, the first attempt I made once I had it installed had me continually ending up in the same room even though I was sure I was taking different routes. An hour of that and I was like, yeah so .. I need a shower. So I took another break. You may have to click on it to see the full size, apparently I can’t crop photos on here anymore. Not that the time stamp in the corner up there says 8:06 pm. That’s right. At this point I’ve been at it for 9.5 hours. Ok, take away probably 90 minutes for meals, dog walking, a shower, etc. and that still has me at 8 hours time spent looking at the computer screen. And I’m not finished yet! 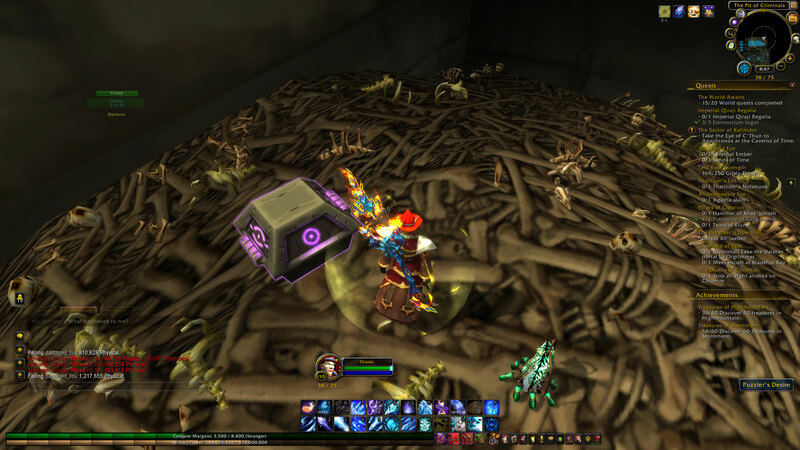 I still have to match these things up, then go to the Forgotten Crypt outside of Karazhan and wander around there until I find this lovely box with the purple runes. Time stamp there is 8:47pm. So yeah … that was a long dang day y’all! But it was definitely worth it. 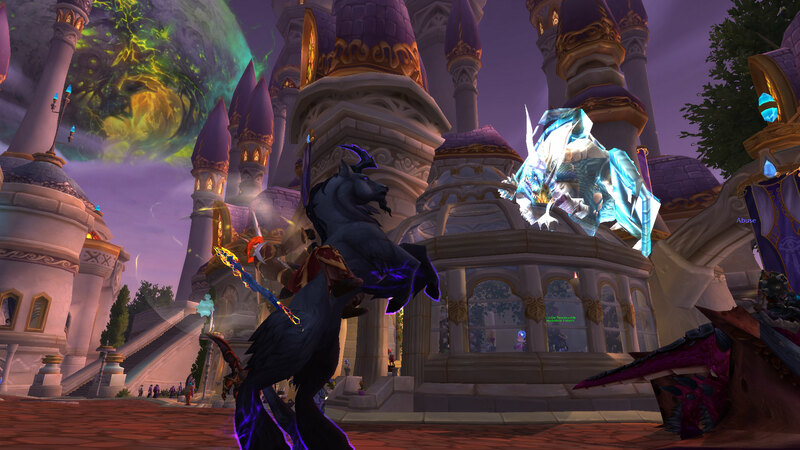 As a bonus, this spectral dragon was hanging around Dalaran because I had Ebonchill equipped at the time, so she made the screenshot that much more awesome. New background image fo’ sho’! So there, stingy elves in Val’sharah! I got a unicorn anyway!! 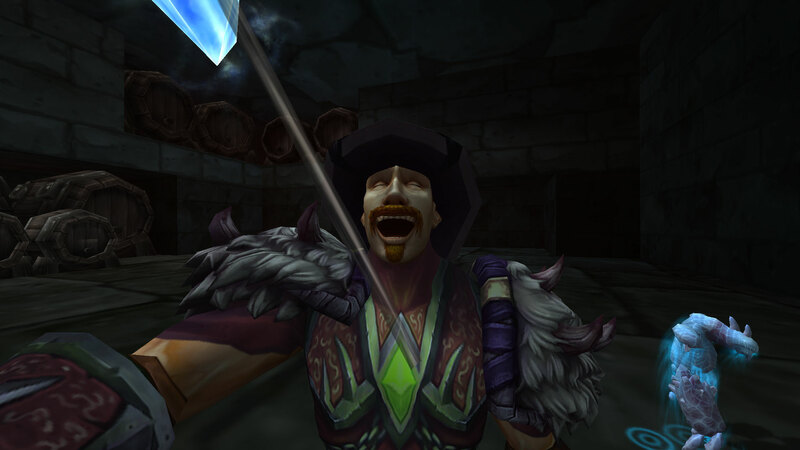 The Draenor Dungeon bonus event went perfectly with the title of this blog. Even though Van is the one who has the most reputations already, since I’ve been maining Sanbec I stuck with him. Fortunately, a lot of people seemed to be doing them, because the dps queue was only around 12-14 minutes the entire week. I managed to get exalted with the Council of Exarchs, revered with the Steamwheedle Preservation Society, and honored with the Sha’tari Defense. He also got to exalted with two of the three Tanaan factions doing his quests there while in queue. These got me many pets and mounts. Aside from that, I’m also still working on An Awfully Big Adventure and getting rep on the Timeless Isle. 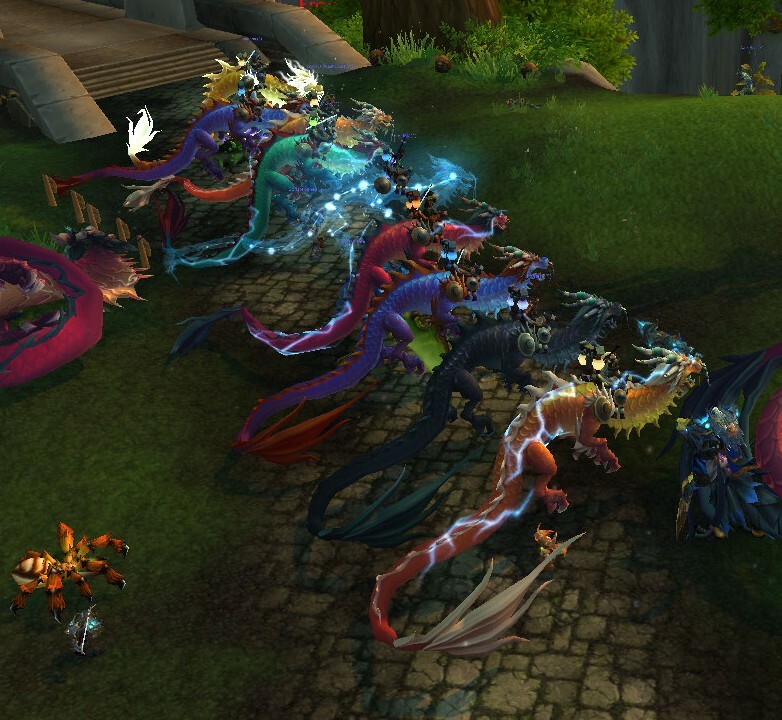 While Van was there this week, there was a lineup of people on Cloud Serpents waiting for Huolon to spawn. Since I still need that mount as well, I joined in the display. Also this week marks the beginning of Brewfest. I haven’t really paid much attention to it the past couple of years, but this year they added a pet and toy, and there are at least two other toys that I don’t have, so I figured I might as well do some. It really takes no time at all to get 100 tokens, in fact you can do it in one day. Two of the items I need cost 100 and two cost 200, so I’m doing four characters … two of them only have to go for one day and get the 100 token items, and the other two have to kill Coren for a few days to get to 200. No big deal. It’s really faster this way if you have multiple alts to do all of the intro quests on instead of trying to earn all of the items with one character. Of course, Karius had to stop for a selfie after killing Coren Direbrew. This week’s bonus event is pet battles, so you can bet I will be out there leveling pets!